Without a doubt, the two greatest pulp magazine heroes of all time were both published by Street & Smith Publications; THE SHADOW and DOC SAVAGE. Month after month the adventures of the Man of Bronze and the Dark Avenger thrilled thousands of readers across the country during the time of the Great Depression. These were pulp sagas of the highest order. Now writer Paul Malmont has written a classic, pulp-like tale wherein the writers of these two heroes join forces to share their own, thrill-a-minute adventure. Walter Gibson, a divorced father of one, an expert on magic, teams up with his chielf literary rival, the larger than life outdoorsman and pilot, Lester Dent. 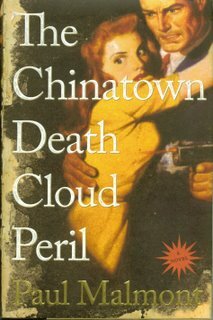 Accompanied by Dent's beautiful wife, Norma, the two men find themselves embroiled in a mystery that starts with the death of horror writer, H.P.Lovecraft adn then climaxes in the streets of New York's Chinatown, where a fanatical madman has come to seek his revenge against those that murdered his beloved family. Interweaving historical events that would precipitate the start of World War II in China, Malmont sets the stage and then populates it with a lively cast of characters as colorful as the purple prose they made their living from. No fan of pulps should miss this true homage to a glorious, long-ago age when gifted writers made a penny-a-word living and in the process entertained an entire generation hungry for escapism and heroes. This book is a humdinger. I don't think I've ever read a bad Donald Westlake book. And when he writes as Richard Stark, there seems to be an even harder edge to his work. This book is no exception. Alan Grofield is a theater actor who moonlights as a robber to support his small, community theater. He is also a professional at his outlaw career and knows a bad deal when he hears one. Such is the case when he's brought on to a job being planned by a fellow named Andrew Meyers. Meyers is a flamboyant, loudmouth who wants to rob a manufacturing plant in upstate New York and escape over into Canada when the job is done. Grofield is invited into the heist by his long time friend and associate, Dan Leach. When Leach and Grofield learn that Meyer's plan involves shooting down guards at the factory, both them exit the job immediately. Their walking away makes an enemy of Meyers, who in turn sets about stealing money from Leach that he had won at the local casino. Leach becomes obessed with Meyers and getting his money back. Grofield, on the other hand opts to cut his loses and return to his wife and the theater. 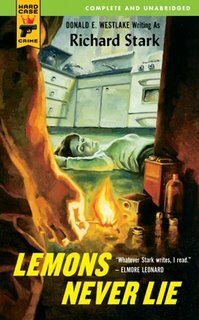 Unfortunately bad pennies like Andy Meyers have a way of resurfacing and eventually he murders Leach, who has come to stay at Grofield's home while he is away on another job. Upon his return home, Grofield learns the true depratvity of Andy Meyers. Thus is born his need for vengeance and he begins tracking down the psychopath with ruthless determination. Stark's ability to make his characters live on the page is sheer genius and he uses subtlety to drive the suspense and tension throughout. Pages have to be turned, as the reader gets caught up in the tale with a feverish need to reach the climax. Where, as always, this master doesn't disappoint. The only true bad thing about any Westlake/Stark book is that it must end. Let's hope the next one is only a little ways down the road. This is crime suspense by a master. Ever since Lester Dent created the amazing hero, Doc Savage, few pulp writers have had the nerve to try and follow in his wake. Oh, there were a few half-hearted attempts back then, one of the most notable being Captan Hazzard-Champion of Justice. But his title lasted all of one issue. Now, some 60 years later, a new Doc clone has taken center stage in a collection of fast-paced, totally over-the-top adventures written by Wayne Skiver. 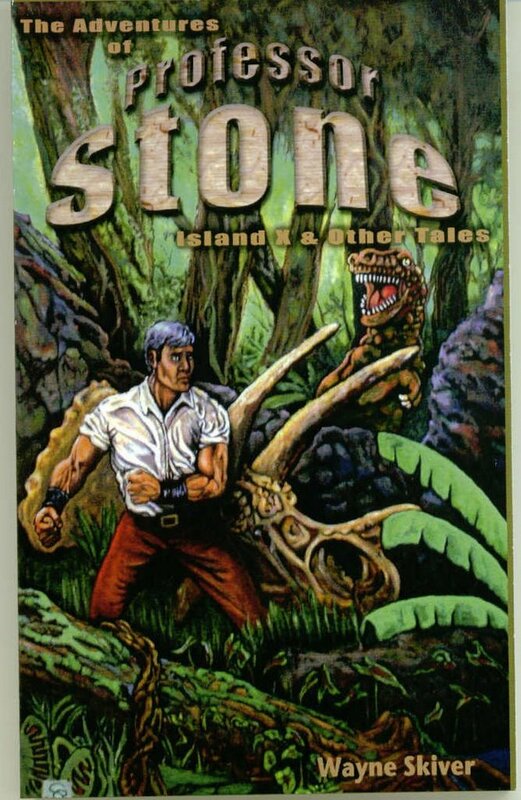 Prof.Stone is a cross between Doc Savage and Indiana Jones as a trained scholar, battler of injustice who travels the globe, pre World War II looking for adventure. It has no trouble finding him. Among these exploits are his discovering an island full of dinosaurs, Nazis Robot soldiers invading England and even an encounter with the fabled Abominable Snowman. Each is a true pulp gem and I'd be hard pressed to pick a favorite. This is a fun read and only available right now through Lulu.com. It's worth the effort to go there and order a copy. Still, early next year, Wild Cat Books, the leading publisher of new pulps, will be producing a brand new, deluxe edition of this book with new added material added. Keep reading Pulp Fiction and we'll let you know when it arrives. You're going to love this. For the past few years I've been writing reviews of what I like to call modern pulp novels. Sadly, the internet sites where the column ran have all shut down over the past six months leaving me with no venue to continue. Then a few weeks ago, several of my friends with mutual reading tastes, directed me to the Blogging world and here I am. Please stop by often as I will not set up any rigid schedule here but will merely review books as I read them. I also believe the pulp umbrella covers a very ecclectic genre range from western to thrillers, sci-fi to fantasy adventure. About the only style you won't found discussed here is romance. Ha. So drop on by. And please, feel free to post comments whether you agree or disagree with my reviews. Differning opinions are most welcome. After all, it's the American way.